Window Server 2003 is a server operating system, and it runs on a computer that provides services to other computers on a net work or over the Internet. What’s more, it have the ability to share files and printers, act as an application server, and host message queues, provide email services, authenticate users, act as an X.509 certificate server, provide LDAP directory services, serve streaming media, and to perform other server-oriented functions. For security on a server computer, it is required to create a strong password. Contains at least six characters. As stated above, this policy is enabled by default. It is very common for many users to forget Windows 2003 password for these or those reasons. You may have noticed that the process of resetting Windows Server 2003 password is not the same as it is on other Windows Operating System. It is somehow difficult for computer novice to do it. Don’t panic. 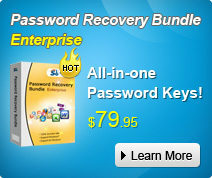 Smart Key Windows Password Recovery Enterprise is by far the most easy-to-use utility I tested. It can recover not only local user password but also reset domain administrator password. 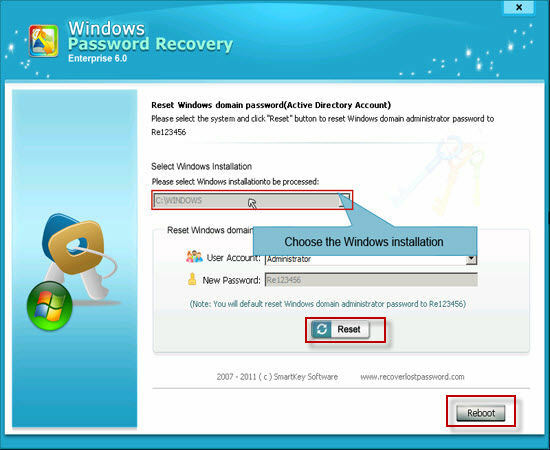 Learning this tutorial can help you become a more adept user for Windows 2003 password recovery. Step 1: Insert your target device onto another computer which can access to Windows. 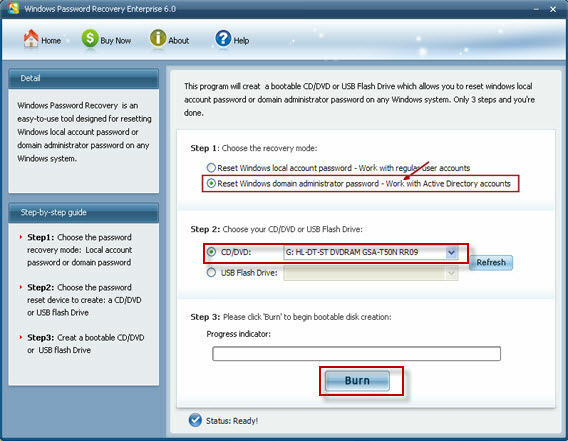 Download & setup & run Windows Password Recovery Enterprise. Tips: For device, it supports CD/DVD or USB Flash Drive. Step 2: To reset local account user password, choose “Reset Windows local account password”. To reset domain administrator password, choose “Reset Windows Domain administrator password”. Step 3: Choose the target device you have inserted in Step 1. Step 4: Click on “Burn” to start bootable disk/USB creation. Step 5: Boot the locked computer from this bootable CD/USB, and that means you need to insert CD/USB in advance and set BIOS to boot it from CD/USB. Step 6: Choose the Windows installation on your PC. Step 7: If you choose to reset local account user password in previous step, here you need to choose one account you want to reset password for. If you choose to reset domain administrator password in previous step, you just need to type your new password directly. Step 8: Click “Reset”, and then click “Yes” &”OK” in the next two text boxes. And then restart your computer by simply clicking “Reboot”. This utility also supports Windows 7/Vista/XP/NT/2000/2008 server.. More info on how to perform Windows password Recovery is waiting for you to explore. How to Reset Windows 2008 password?